In 2016, The City delivered more than 100 programs, services and small-scale improvement projects to a first group of 14 communities. In 2017-2018 The City worked with a new group of 14 communities. Thank-you to everyone who provided feedback, the engagement for all 14 communities is now closed. You can find the What We Heard reports in an overall and project summary format for all 14 communities. To see the details of What We Heard and what initiatives are happening as a result of the engagement click on the tiles below. All of the communities that participated in the This is my neighbourhood initiative in 2017-2018 are listed below. 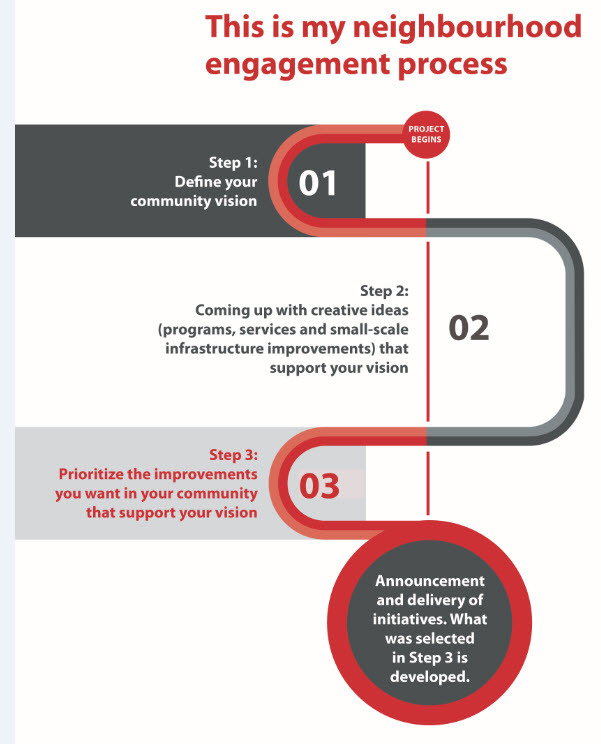 Click on your community to learn more about what we heard and what is to come as a result of the engagement. This timeline applies to the second set of communities: Abbyedale, Banff Trail, Copperfield / Mahogany, Glendale, Meadowlark Park, Saddle Ridge and Silver Springs.